Reptile Enclosure Insecticide effectively and safely kills and controls mites. – Low toxicity, safe for humans and reptiles. 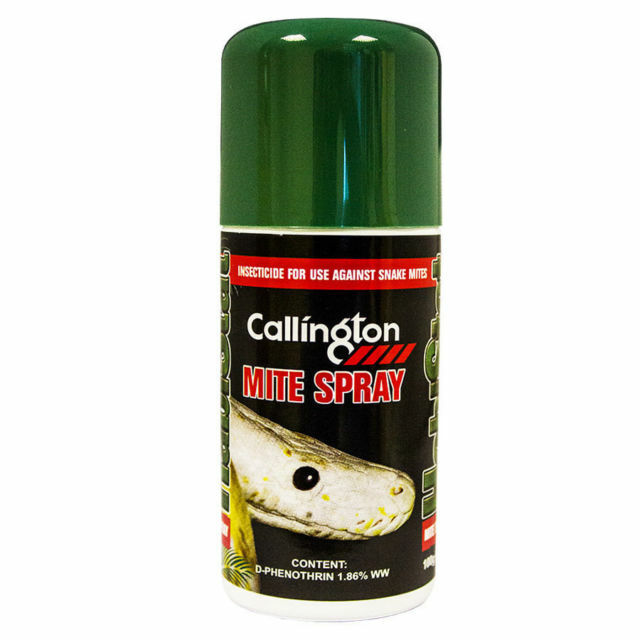 – Effectively kills and controls mites. – No need to rinse off after application. – Aerosol spray easy for application. – Remove food and the water bowl from the enclosure before application. – Leave the snake in the enclosure. – Do not rinse the enclosure or the snake after spray. – Replace the water bowl after 24 hours. This will avoid the snake soaking and reducing the effectiveness of treatment. – Can be used directly on snake. Spray from a distance of 30 cm avoiding the eyes. – Repeat treatment every 7 days until mites are eradicated. – After treating the reptile and the enclosure, spray a line around the enclosure to create a barrier. – Frequently (every day or two) spray around the enclosure to keep the barrier working during treatment. – Suggest use paper as bedding during treatment so that changing the bedding is easier. – Do not wait to treat mites as they are the no.1 killers of reptiles. – Spray the enclosure surrounding area as well.